Now that I've shown you the Multicolor Dinner Plate, I want to show you some of the other items in the tablesetting. They really did turn out beautiful didn't they? It just amazes me I can take Chinets' products and create something so amazing with just basic supplies. We can use the Chinet line of products for our future parties too as they're so easy to "party up". I can think of a gazillon ways to decorate with these. Desserts are special when served on Chinet! 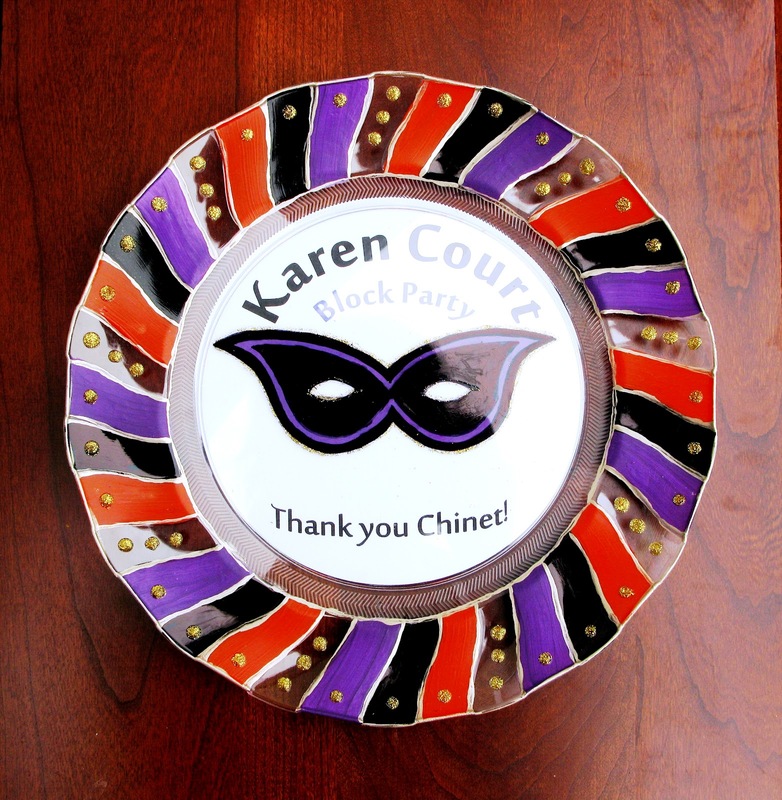 Multicolor Dinner Plate began as a Chinet® Cut Crystal® 10" Dinner Plate. I used simple Gloss Enamel (acrylic water based) paint sold at the craft store and Martha Stewart Living metallic paint in vintage gold for highlights. The dots were applied using gold glitter glue. Most of the paint was applied to the back; the glue to the front. However, all paint could be applied to the back with virtually the same results. I knew this would be photographed and would therefore need paint applied to the front to reduce glare. ﻿﻿Glitter Dot Dessert Plate This plate began as a Chinet® Cut Crystal® 7" Dessert Plate and co-ordinates beautifully with the Multicolor Dinner Plate. 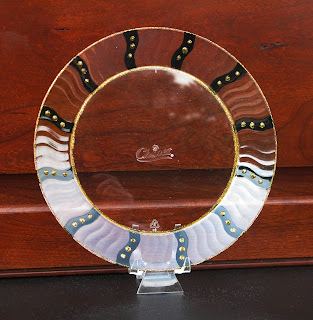 Using the embossed design of the plate, I easily used gold glitter glue to place dots on the rim of the plate and to encircle the edges on the back. If you wish, the dots could be placed on the back. After allowing to dry, I used black Gloss Enamel to paint over the stripe area where I had previously placed the dots. 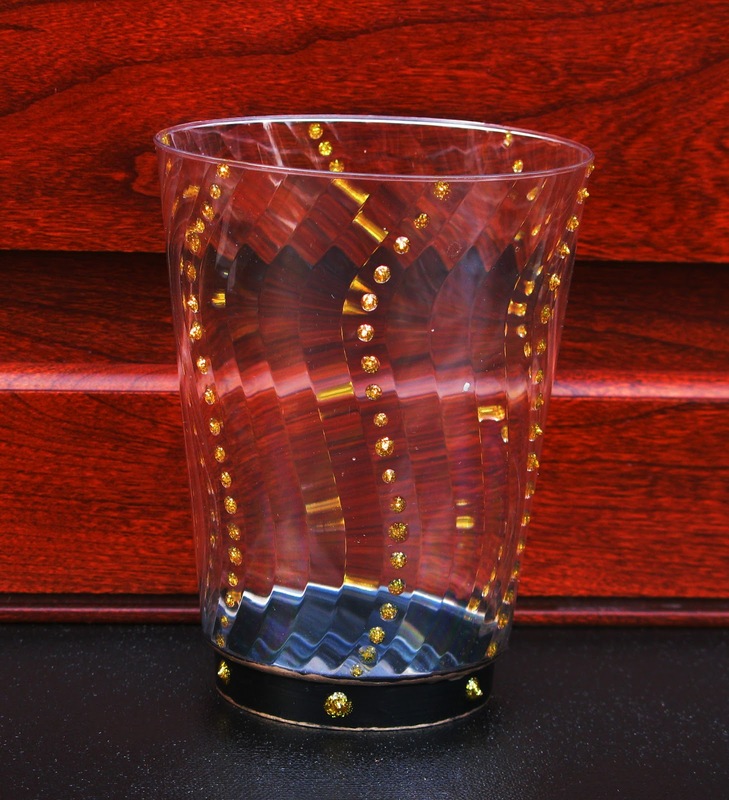 ﻿﻿﻿﻿﻿﻿﻿﻿﻿﻿﻿﻿﻿﻿﻿﻿﻿﻿Glitter Dot Cup This cup began as a Chinet® Cut Crystal® 14 oz. Cup. 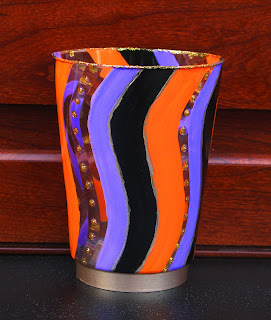 For both cups, like the plates, I used the pattern of the cup to determine the placement of the paint. It was really simple. 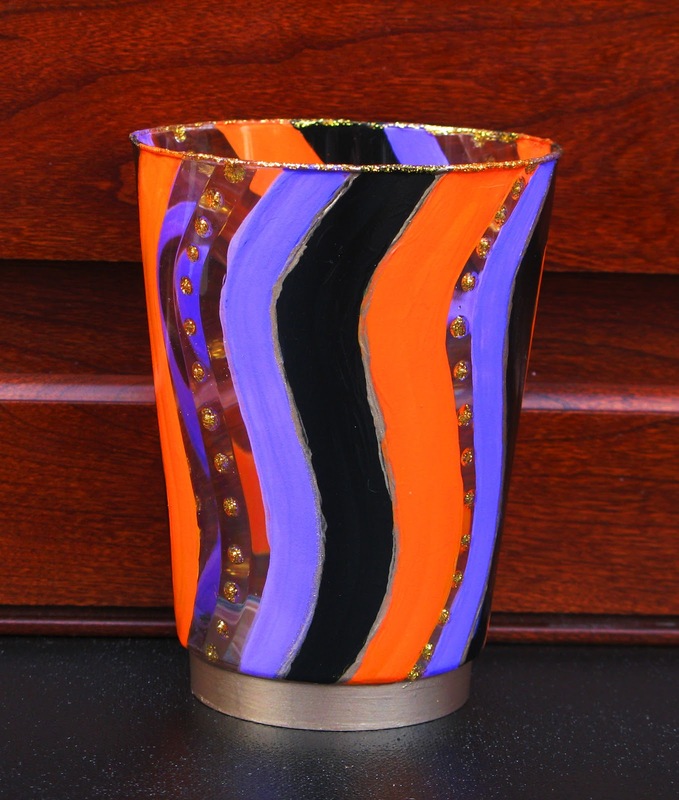 For this cup I used gold glitter glue and black gloss enamel paint. These will be used as our beverage cup. 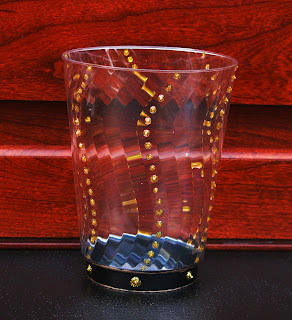 Multicolor Cup This cup began as a Chinet® Cut Crystal® 14 oz. Cup. 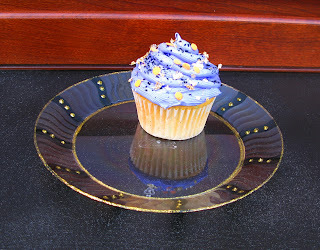 I used simple Gloss Enamel (acrylic water based) paint sold at the craft store and Martha Stewart Living metallic paint in vintage gold for highlights. Because these cups are painted all the way to the rim and because they are more labor intensive I decided to use them as a decorative piece rather than a beverage cup. They will serve as the holder for the table arrangement. TIP Create a simple motif and repeat it throughout the decor. This creates visual appeal and interest your party guests will appreciate. 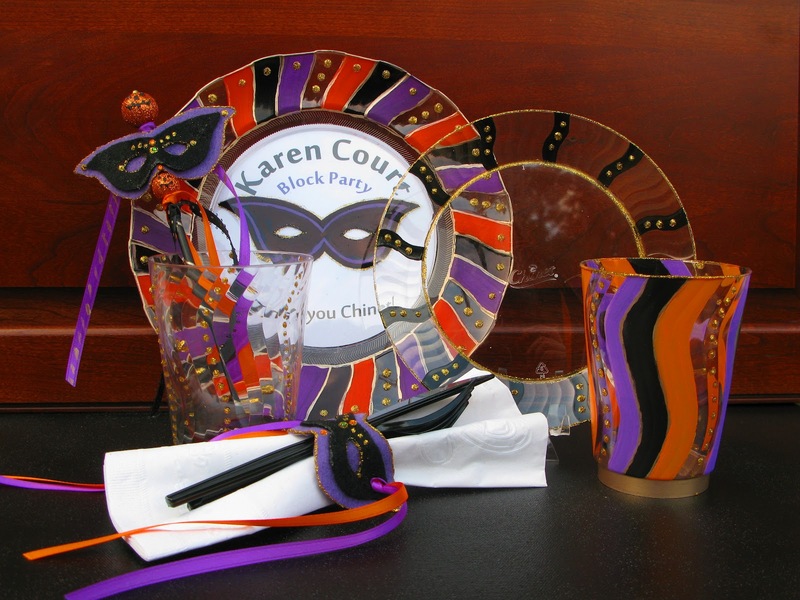 The motif I chose to repeat for the Ultimate Block Party is the masquerade mask. 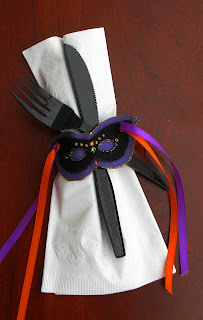 Masquerade Napkin Tie These cute little mask napkin ties are made of felt embellished with glitter glue and rhinestones. 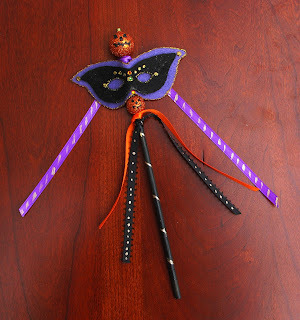 I used a pattern to make two sizes of the mask (one purple, one black) and glued the together. 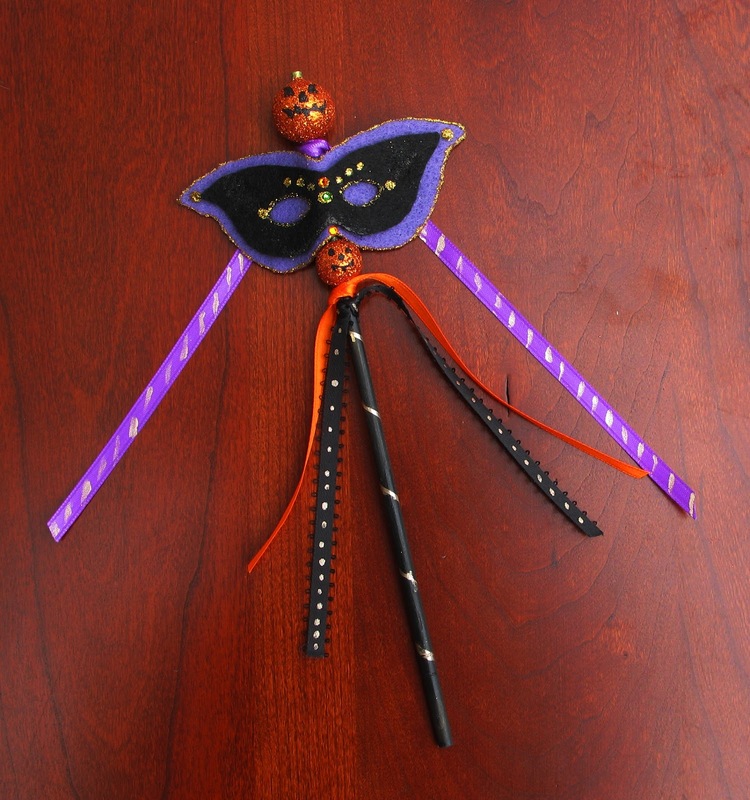 After the glue was dry, I punched holes in both sides of the mask and attached ribbon.